Unlike its Indian and African cousins, the critically endangered Sumatran rhinoceros is covered with patches of stiff hair, most prominent on its ears. 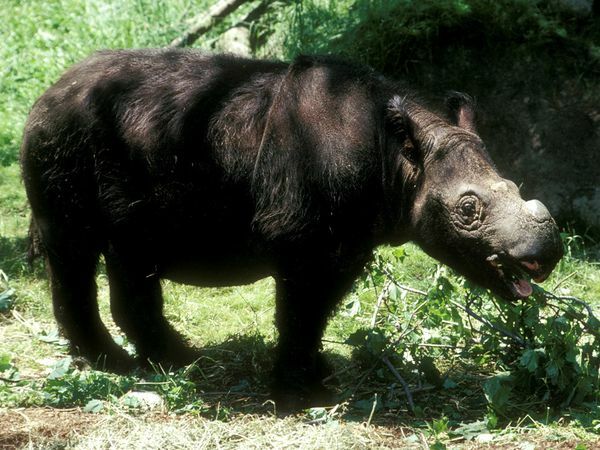 Fewer than 400 Sumatran rhinos are thought to exist, making it one of the rarest large mammals in the world. As the smallest rhino, they weigh about 1,760 pounds (800 kilograms), and grow to a height near 5 feet (1.5 meters) at the shoulders and 8 to 10 feet (2.5 to 3.2 meters) in length. Unlike most other rhinos, their hide, dark red-brown in color, is covered with patches of short, dark, stiff hair. The hair helps keep mud caked to the body, which cools the hide and protects it from insects. The Sumatran rhino’s two horns are considerably smaller than those of their African relatives, the black and white rhinos. The anterior horn may grow up to 31 inches (79 centimeters), but is normally much smaller, while the posterior horn may grow up to 3 inches (10 centimeters), but is generally no more than a hump. Listed as critically endangered, there are thought to be fewer than 400 Sumatran rhinos in existence today. While a number of these animals are kept in zoos, they rarely breed in captivity. In 2001 a calf born in the Cincinnati Zoo in Ohio was the first Sumatran rhino born in the United States, and the first successful captive delivery in over 100 years. The main threats to their survival in the wild include poaching and habitat encroachment by humans. 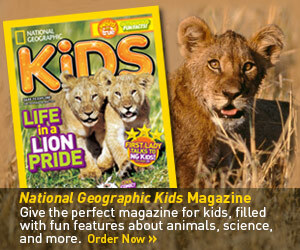 Find out what National Geographic Society is doing to save animals all over the world, and learn what you can do to help. The Hawaiian monk seal is one of the oldest species of seal on the planet. But their tenure in paradise is perilously close to its end, only about 1,100 seals remain in the wild. The king of cats rules with a roar and a fierce bite. What else do you know about this top predator? Big cats are quickly disappearing. Now is the time to act. 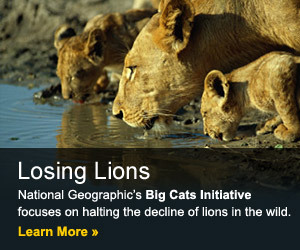 Cause an uproar to save big cats today. Champion divers but clumsy landers, doting parents but hostile neighbors—northern gannets abound in contradictions. Photographer Sven Začek provides an intimate view of this large raptor.